Yikes. I’m sorry Dr. Ross, but there are far too many important things to worry about on this planet of ours to fret over “misrepresented” chimpanzees. I can’t take your argument seriously enough to work up a cogent response. (Ditto for the post at Animal Person yesterday “On Speciesism and Animal Actors.”) But, I will say that it has never crossed my mind that pictures of cute pandas, peaceful dolphins or grinning chimpanzees meant their species were all thriving and safe — and I can’t imagine why you’d think [reasonably thoughtful] members of our species would have that illogical reaction. I’m pleased, however, that Ross’ piece got me to Google my favorite childhood chimp, Cheeta, to see how he’s doing. 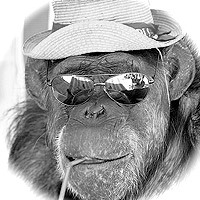 In 2006, I wished the co-star of a dozen Tarzan movies, and oldest living nonhuman primate, a happy 74th birthday. Today, I want to congratulate Cheeta (that’s him at the head of this paragraph and of this posting) for getting a star on the Hollywood Walk Of Fame earlier this month. (See The Mirror.co.uk, August 7, 2008). And, we can celebrate Cheeta’s latest comeback, at 76 — appearing in a new video of the hit country music song “Convoy,” which can be downloaded from iTunes. 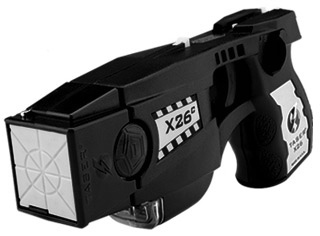 Greenfield’s Bullish on Tasers: We don’t usually look to criminal lawyer Scott Greenfield of the Simple Justice weblog for investment tips. But, today we find Scott touting Taser International (July 21, 2008). The TASER can be used more effectively and safely with less training than other self-defense technologies. TASER devices are not considered firearms. They can be legally carried (concealed or open) without permit required in 43 states. For now, I’m glad to be living in New York, as “TASER is not available for private citizen defense in DC, HI, MA, MI, NJ, NY, RI, & WI.” But, recent Supreme Court action on the 2nd Amendment suggests they’ll soon be available legally everywhere. So, as Scott says: “there can be only one smart move: invest [in Taser]” — and never leave home. Enough monkey business ’round here. How about a few more selections from Missed Appointment by Gary Hotham? Thanks very much for featuring Gary Hotham’s work from “Missed Appointment.” I was thrilled for him when he received an Honorable Mention for “Missed Appointment” in this year’s HSA annual Kanterman Memorial Books Awards. Couldn’t happen to a more generous guy. Don, Thanks for reminding us about the Kanterman honors for “Missed Appointment.” I keep waiting for the official announcement from the Haiku Society of America. Congratulations also to you, as editor of the publisher, Lilliput Review and Modest Proposal Chapbooks. That’s ridiculous. I, for one, have never been able to resist a monkey card. My 2 y.o. son seems to have inherited this trait; therefore it must be a good characteristic favored by nature. Very convincing, Anne. That monkey DNA gets around. On this anniversary of the Scopes Monkey Trial, let me clarify: I meant that nature seems to favor our irresistible impulse to buy monkey cards, not that we possess any actual monkey DNA. Although, my son may have a monkey for an uncle. The jury is still out on that. Gary Hotham should consider reading the Op-Ed peice carefully and perhaps (gasp) even doing some reasearch before commenting on something. You “can’t imagine why you’d think members of our species would have that illogical reaction” and yet the premise of these points is that a very strong scientific survey pointed out that this is precisely what many people were thinking! Thanks for the Comment, Steve. (Am I right to assume that you are the author, Steve Ross?) I’m sorry for any confusion: Gary Hotham merely wrote the poems, he has nothing to do with the content of the posting, which — as indicated — is written by myself, David Giacalone. I’d be happy to hear more about that study, Steve, especially whether it is the cards and ads with smiling chimp faces that cause the conclusion. Even if there were a link, as with satire, I do not believe in censoring materials merely because it might be misunderstood by a segment of society. The study was published in Science Vol. 319 (March 14 2008). The survey itself actually used “neutral” pictures of apes but when questioned why people did not think chimpanzees were endangered (those who responded that way) most often cited their frequent appearances as actors in movies and televsion and advertisements, etc. I realize that many people interpret these studies as attempts to censor what people see and how people feel…but this is not the point. The fact is that these images and the practices that lead to them have serious welfare and conservation implications that we should all be aware of. While I hope that the day is coming when these practices will not exist for these reasons, I think our role at this point is educating folks on the context of these images. Ultimately, the public will decide what is “acceptable” or not. Thank you for giving us more, Information and explanation, Steve. I’m still finding it hard to believe that the people who are making this misinterpretation are the opinion makers and policy leaders who will decide whether resources are used to help chimpanzees. As with lovable pandas, polar bears and dolphins, I believe the affection the public feels for those smiling chimpanzees can be used to help tell their story and have it heard. I’m worried that your position — by sounding too extreme — will turn off a lot of people who would otherwise be in support of the conservation efforts. Missed Appointment is a great collection, and that loon haiku is one of my favorite. It’s the first book by Gary that I read, and I liked it so much I bought Footprints & Fingerprints, Breathmarks, and another chapbook that I just ordered last week but can’t remember the name. The honorable mention is awesome, but I think Missed Appointment could’ve won 1st place in the contest if it had a picture of a smiling chimp on the cover. My introduction to Gary (after seeing him in Cor’s Haiku Anthology) was “Breath Marks: Haiku to Read in the Dark” (Canon Press 1999). At 110 pages, with 80 poems plus an essay, I thought it was a wonderful deal at $8. Tonight, I just discovered that Audubon Press has it on sale for $3.75, making it the best deal in all of the haijiniverse. I urge readers who do not possess Breathmarks to click through to Audubon, or (like I did a few years ago) give it to a friend — especially one who does not yet love haiku. Wow, that’s quite a deal. I also got it for $8, but I don’t feel cheated at all. Definitely a strong collection. I’ll post a link to that Audubon Press deal on my site. That’s a price many people should take advantage of.